Hardware TNC and DSP Processor – together at last. The above looks like a plastic case. Rest assured it is 100% extruded aluminum with metal end-plates. It’s very light, but quite sturdy and appears to have ample ability to contain RFI so long as the signal IO is properly filtered. While not my favorite peripheral communications standard, I completely understand the reasoning to use USB for the serial communication needs given the lack of “stock” EIA-232 ports on anything other than industrial computers. This makes a lot of sense for the user market where USB is the norm. In professionally engineered systems like the VAPN, multiple USB ports of identical devices add work for the computer system engineer to ensure each port comes up every time. As well ensuring they come up in the same order often requires extra steps in system boot scripts. In response to my query, the SCS engineers did suggest the raw serial port signals are available to tap on the board. Hence should the potential USB issue above prove to be problematic, a hardware hack is available. Simple screw terminals in the back accept a broad range of voltages making integration into a rack power system a breeze. The Tracker manual contains a plea to not use the same power supply that powers the transceiver. I understand the reasoning, but a separate source of DC power is an awful lot to ask. We will test with both sharing one power supply with well dressed and filtered lines and see what happens. The key that makes this TNC different from others is the elimination of hardware modem components and, instead, placing a 100 Mips digital signal processor between the radio and computer. This facilitates placing sound-modem like algorithms into TNC hardware alleviating the need for the host computer to perform this task. It’s true most any PC has plenty of processing power to handle a few sound card tasks. However one has to wonder how well a PC processor will handle multiple soundcard ports at the same time. Hence distributing the DSP tasks to each port’s hardware ensures the host PC is never burdened with anything other than simple, relatively slow, serial streams. That’s a lot of capability in one compact well built box and with a 100 Mips DSP that’s also thrifty on power consumption. For the portable op, this little device may be the only TNC you need for most any packet mode… short of Pactor. Combine this with a simple terminal program and you have a packet station. For VAPN use, our eyes remain fixed on the Digital Signal Processor that offers a measurable decode improvement over hardware modem chip solutions. The DSP will help VAPN communicate more reliably with thrifty VAPN clients using inferior hardware modems such as the TNC-X. With a DSP comes re-programmable firmware and the Tracker is no exception. Taking a tip from the DireWolf developers, we burned a CD with the WA8LMF 25 minute APRS sessions and played tracks 1 and 2 from a CD player directly into a sound card to test DireWolf and the Tracker. During the Tracker tests I got the attention of the SCS firmware developers who were kind enough to provide several test versions improving the 1200 decode performance. This occurred over just a few days so hats off to SCS for caring. No one seems to know how many packets can be heard on the WA8LMF, but “around 1000” appears to be the general idea. Here are the results from the tests revealing the number of APRS packets with successful decodes. Shown as well is the same data with sequential unique duplicate packets merged. DireWolf 1.2 does a very good job with raw packet decodes, but has a few duplicates that reduce the total unique packets down just a bit. SCS Tracker firmware revisions start with 1.5i (shipped in the TNC) and end with 1.5s. The 1,710 packets decoded in revision 1.5p was determined to be dupes from the several parallel decoders. Later versions properly removed the dupes in real-time. Improvement of Tracker 1200 decode performance is evident suggesting SCS cares about making the Tracker competitive with soundcard based TNC solutions. We used the unix command “uniq” to filter adjacent matching lines from the capture log of each test after lines were stripped of timecode information. To be fair, we are not 100% sure this is the right approach for this test, but it seems to provide some solid trending information. DireWolf is a clear winner in our tests, but the SCS effort was well worth the two days they spent responding to our requests. At this point the trade space in decode ability is about the same leaving only the logistics of a RiPi/DireWolf combination vs. the SCS Tracker. Having to choose between the two is a good problem to have. The SCS Tracker has been in our block diagram from the earliest moment of the VAPN. 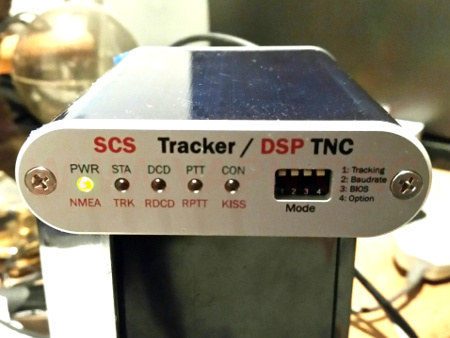 Originally the SCS Tracker TNC was just for the HF ports to run HF Packet and Robust Packet modes. We always knew it handled 1200 and 9600 as well, but weren’t sure it was the best solution for these ports. Only when we bought one and interacted with SCS’s engineers did we realize how good it is for 1200. We are leaning towards the SCS for all VAPN ports at the moment.